Vik Muniz is a contemporary Brazilian artist who is based in New York. 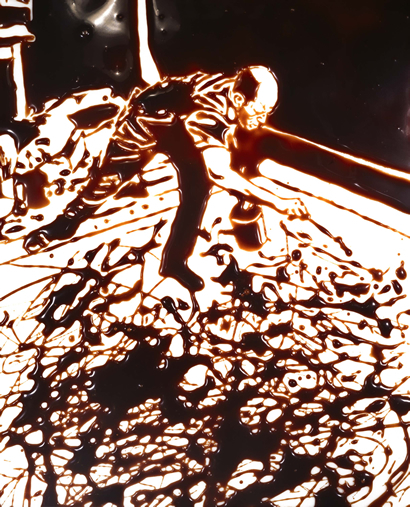 He is particularly interested in referencing images from pop culture or fine art, but with the use of unconventional mediums like peanut butter, syrup, wire, and sugar. A few years ago, I saw his works Double Mona Lisa (Peanut Butter and Jelly) (After Warhol) and Medusa Marinara (among many others) at an exhibition in Seattle. 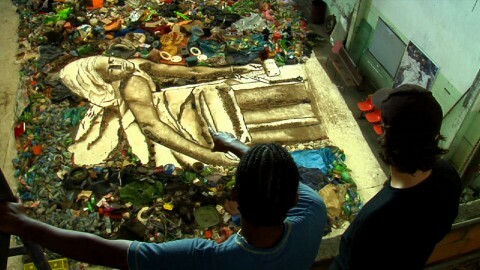 Last night, I watched the documentary Waste Land which discusses how Muniz created “Pictures of Garbage” (2008), a series of large-scale portraits that were comprised of rubbish and junk that was found at Jardim Gramacho, a large landfill near Rio de Janeiro. The ThinkShop blog has already highlighted the Marat: Sebastião portrait that was created as part of this project, so I won’t say much on that topic here. Instead, I wanted to point out how different visual perspectives (particularly aerial views) form an interesting aspect of the documentary and Muniz’s work itself. 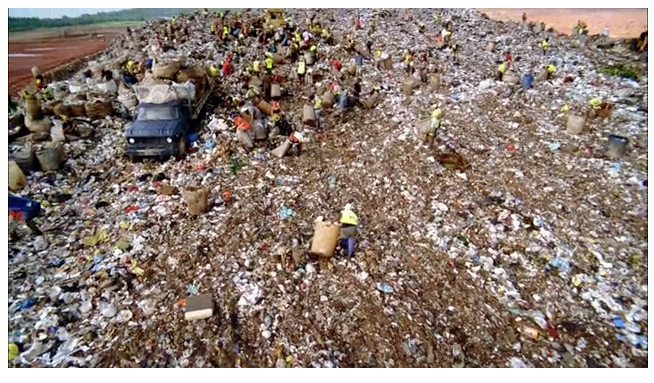 There were several points in the documentary where the film would pull out to show aerial views of the recycling pickers at Jardim Gramacho. I remember at one point someone commenting that the workers looked like small ants from such a distance. It was interesting to see that Muniz’s own approach to creating his photographs was also with an aerial view approach. After taking photographs of his subjects, the image was projected on the bottom of a studio floor. Recycling pickers were recruited to help fill the portrait shadows and lines with different types of materials that were taken from the landfill, under Muniz’s supervision. The documentary has a few great shots of Muniz giving orders to the assistants below, using a laser pointer to indicate what areas needed attention. Viewer looking at a detail of Muniz's "Narcissus (after Caravaggio)"
Interestingly, though, I noticed that the documentary had several scenes which scanned up-close details of either the recycling pickers or the final works of art created by Muniz. 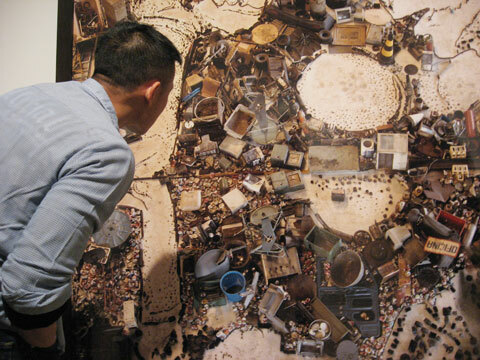 Both an aerial (distanced) view and an up-close view were presented in the film, which mirrors the perspectives that Muniz wants to encourage for those who view his works of art. Muniz said as much in the documentary itself, and also in a different interview: he wants viewers to step away from his photographs to see the overall subject matter clearly, but then step close to the the photographs in order to notice the medium and details. It is this back-and-forth movement of the viewer (which almost seems ritualistic to me, particularly in a museum setting) that Muniz wants to encourage. I’m quite a fan of works of art that encourage such dynamic interactions between the works of art and the viewer. I like to think that, as a Brazilian, Muniz is influenced by colonial Brazilian art (i.e. the Brazilian Baroque) which requires such participation on behalf of the viewer. For those who are interested, Muniz created another series two years earlier that was also based in Rio de Janeiro. 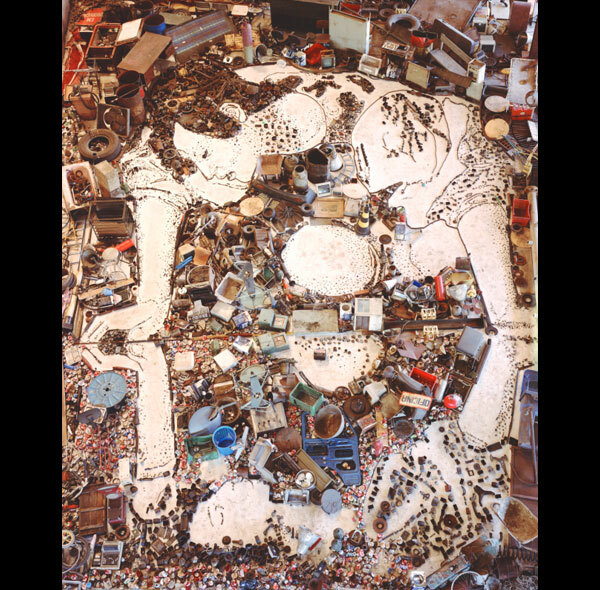 “Pictures of Junk” (2006) was created with the help of art students in an underprivileged area in Rio de Janeiro. These works of art were also made with junk, but the compositions were based off of famous Western works of art, such as Narcissus (after Caravaggio) (shown above), Saturn Devouring One of His Sons (after Francisco de Goya y Lucientes), and The Birth of Venus (After Botticelli) (Triptych). I hope they will get the recognition they deserve. Hi Sedef! Thank you for your comment! I was not familiar with Yao Lu’s work until I read your comment. He and Vik Muniz have similar interests! It seems like today, in a postmodern world, artists are much more interested in context and the processes behind works of art. Perhaps garbage mounds and dumps are appealing to these artists, because these spaces tell so much about context, process, and place: they are site-specific areas, since they are comprised of the human trash from a certain area and time. I hope you get a chance to watch Wasteland! I know that it is available for streaming online in several places, including Netflix.